the demand of the enterprises and markets. level is the normal skilled workers, i.e. the specific operators. of this proportion and the inaccuracy of the education target. reservoir engineers, or oil production engineers. it much clearer that what the purpose and orientation should be. degrees contains course learning, practice link and dissertation. nomically, extract, store and transport the oil and gas safely. and the practical link is listed in Appendix II. titles in campus or industrial establishments. and gas enterprises and college teachers. troleum enterprises, and it is some kind of customized training. them finish their study successfully. study of one aspect of a large-scale engineering problems, etc. petroleum engineers, which will help them to get a job. professional degrees to be the cradle of petroleum engineers. 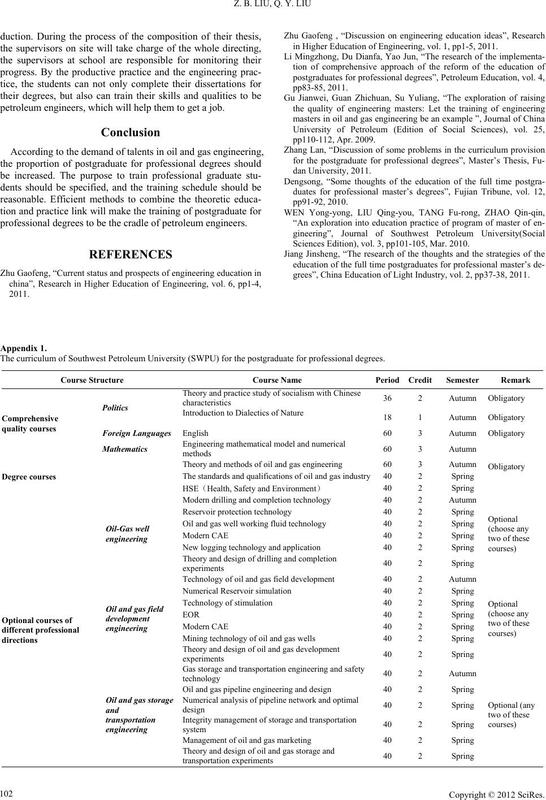 in Higher Educ ation of Engineer ing, vol. 1, pp1-5, 2011. Sciences Editi on), vol. 3, pp101-105, Mar. 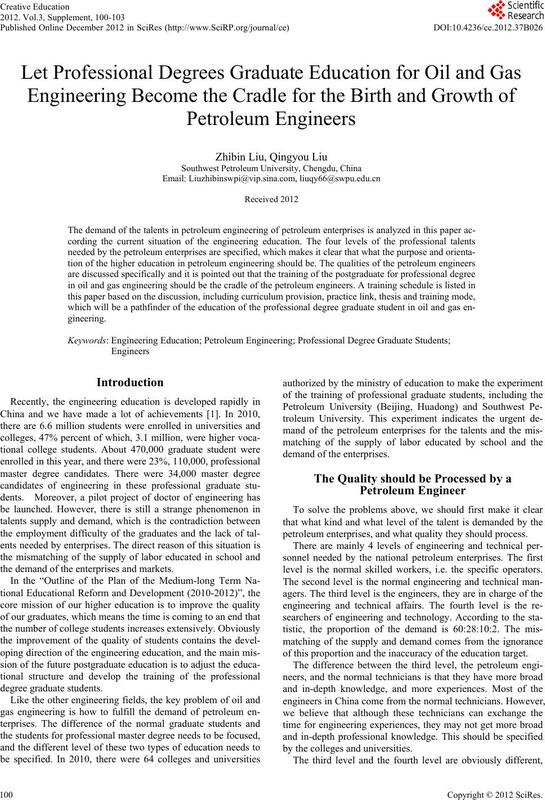 2010.
grees”, China Education of L ight Industr y, vol. 2, pp37-38, 2011. 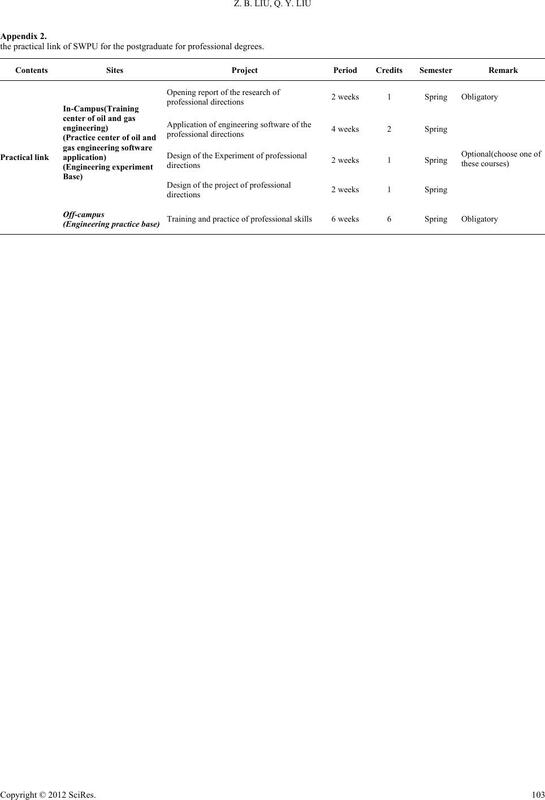 The curriculum of Southwest Petroleum University (SWPU) for the postgraduate for professional degrees. the practical link of SWPU for the postgraduate for professional degrees.